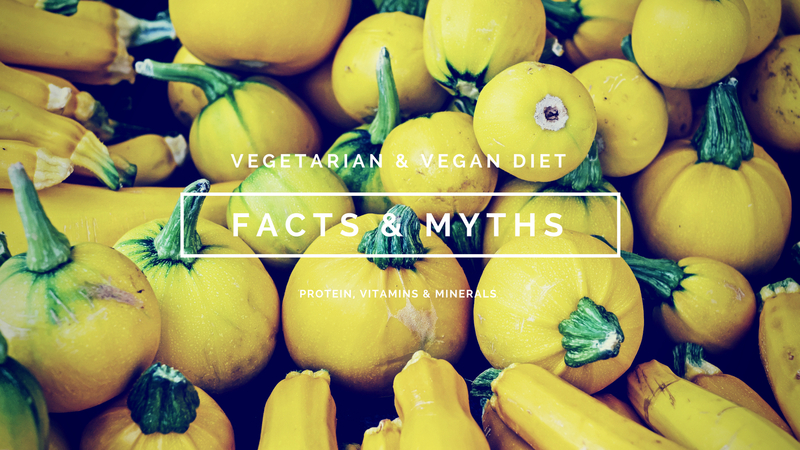 Vegetarian and vegan diet facts and myths. In my experience, every time I say to someone that I do not eat meat, the same questions follow: how do you get enough protein in your diet? Do you have to eat a lot of beans and legumes? Isn’t it necessary to eat meat to have all the vitamins and minerals? Etc., etc. So, as far as I can see, there is still a lot of confusion regarding vegetarian and vegan diets. Personally, I am neither vegetarian nor vegan. I am pescetarian, but because I only eat fish couple of times per week, and eggs and dairy are mostly breakfast foods in our household, most of my weekly dinners are actually vegan. So I think I am qualified to shed some light about herbivore lifestyle onto all parties concerned, and provide some useful information regarding vegetarian and vegan diet. Do I get enough? Yes. Do I have to eat beans everyday? No. First of all, what is protein? Protein consists of essential and non essential amino-acids which are the building blocks of all life. Amino acids are found in all kinds of food, even lettuce. There are 22 amino acids, 20 of which are most common and only 9 or 10 (that is up for debate) are essential – which means we have to get them from food. The difference between animal vs. non animal protein is that animal protein contains all of the essential amino acids, therefore it is considered to be a complete protein. Some plant foods are also a source of complete protein, quinoa for example, but it is rare. So in order to get a complete protein on the predominantly plant diet one must combine foods with different amino acids, for example a combination of broccoli and brown rice will provide a complete protein. It sounds a bit arcane, but it is very simple. A bit of reading and practice will make anyone an expert on these food combinations. However, it is not even necessary to combine different plant foods to make a complete protein, because the real question is, do we need to consume a complete protein in one go and with every meal? For most people the answer will be no. Eating protein with every meal, and eating a complete protein with every meal is not as important as many people tend to believe. It really doesn’t matter whether you consume Lysine with your eggs or tofu in the morning and Tryptophan with your potatoes or quinoa in the evening, as long as you get them all at some point, you are fine. Vegetarians especially have absolutely no problem with protein consumption because they do eat dairy products and eggs, and sometimes even fish. Vegans eat plenty of protein containing grains, nuts, beans, legumes and vegetables. Another thing worth noting is that plant protein is faster absorbed and broken down than animal protein, so it causes less inflammation during digestion process and less strain on kidneys. Especially if focus is on vegetables rather than grains and beans. For the most part, iron consumption is more important for women and children than for men. Women during menopause and men need much less iron, because it accumulates in the body and can cause more damage than good for that particular demographic. However, it is common among vegetarians and vegans to be borderline anemic, if they do not consume enough green vegetables. This is especially relevant for children, since they can be such picky eaters. So, to ensure sufficient amount of iron, women and children can take supplements or make sure to eat leafy greens with every meal. Not only greens ensure iron supply, they also provide the very important vitamin K, folate and many other nutrients, as well as reducing inflammation. So, overall it is better to eat greens to get iron, than to eat a steak. B12 is more of a problem because it is primarily found in meats. BUT! Animals do not produce B12 – bacteria in soil and in the intestines of cows and sheep do, provided they graze on cobalt rich soil. However, majority of livestock does not even eat grass anymore, and caged chickens do not get to eat worms and insects, they are all fed with grain, which has no B12. So to combat anemia among livestock, animals are given B12 supplements. Therefore, it is much better for both plant eaters and carnivores alike to just take that supplement yourself – it will be of better quality and absorption. Luckily we need very little B12, but in larger doses that you get from supplements it is an excellent energy boost and quite safe. There is a reason it has been added to almost every energy drink and pre-workout shot – it really works! Apart of Iron and B12, there are no other important nutrients that can not be consumed in plenty through herbivore diet. On average, vegetarians and vegans have less inflammation related diseases, such as arthritis than meat eaters. As for variety, there is a whole world of non animal foods out there to try. Importance Of Choline For Pregnancy And Breastfeeding.